The year is 1988. High school sophomores Abby and Gretchen have been best friends since the fourth grade. But after an evening of skinny dipping goes disastrously wrong, Gretchen begins to act … different. She’s moody. She’s irritable. And bizarre incidents keep happening whenever she’s nearby. Abby’s investigation leads her to some startling discoveries—and by the time their story reaches its terrifying conclusion, the fate of Abby and Gretchen will be determined by a single question: Is their friendship powerful enough to beat the devil? My Best Friend's Exorcism takes readers on a nostalgic trip through the 80's where crimped hair, E.T. and Phil Collins were all the rage. The book incorporates high school drama (a lot of high school drama), bits of horror and one hilarious exorcism into one gory (kind of, not really) package. Most of the characters were well written. Each had their own quirks, but nothing too extreme (exorcism aside). I was able to relate to them which made them believable. The only two which really got to me were Gretchen's parents. They really got under my skin. It was hard to believe that both parents would be THAT blind to their child's condition. As for the story, it flowed well and had its fair number of twists and turns. What would have made this a 5 Star would be for a slight change in the ending, it was a bit too predictable for my liking. 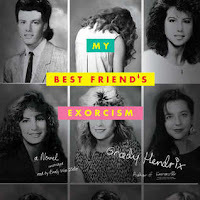 My Best Friend's Exorcism is a great read to get you in the mood for Halloween (yes, I'm 2 weeks late..). For even more fun, I'd recommend downloading the audiobook. Emily Woo Zeller does a fantastic job bringing the characters to life. However, I do think a second narrator, especially during the exorcism, would've added more depth to the scenes and provided some extra scare factor. My warning for potential readers: after reading My Best Friend's Exorcism, you'll never be able to listen to the Go-Go's We Got the Beat without thinking of demonic possessions. If you're OK with that, then this book is for you!